SANTA CLARA, CA--(Marketwired - November 18, 2015) - Infoblox Inc. (BLOX), the network control company, today announced that creation of DNS infrastructure by cybercriminals to unleash exploit kits increased 75 percent in third quarter of 2015 from the same period in 2014, as reported in the newest edition of the Infoblox DNS Threat Index, powered by IID, the source for clear cyberthreat intelligence. Exploit kits are a particularly alarming category of malware because they represent the automation of cybercrime. A small number of highly skilled hackers can create exploit kits, which are packages for delivering a malware payload, and then sell or rent these toolkits to ordinary criminals with little technical experience -- vastly increasing the ranks of malicious attackers capable of going after individuals, businesses, schools, and government agencies. The Infoblox DNS Threat Index (www.infoblox.com/dns-threat-index) measures the creation of malicious DNS infrastructure, including exploit kits. Four exploit kits -- Angler, Magnitude, Neutrino, and Nuclear -- accounted for 96 percent of total activity in the category for the third quarter. Most exploit kit attacks are distributed through spam emails or compromised websites, or are embedded in online ads. When users click a link in the emails or ads, the exploit kit takes advantage of vulnerabilities in popular software to deliver a malware payload that can perform actions such as planting ransomware, capturing passwords for bank accounts, or stealing an organization's data. Cybercriminals need the Domain Name System (DNS) to register domains for building the "drive-by" locations where exploit kits lie in wait for users, and for communicating with command-and-control servers that send instructions to infected devices and extract information. "Exploit kits are behind some of the highest-profile attacks in recent months," said Craig Sanderson, senior director of security products at Infoblox. "For example, a recent Angler attack on a major British newspaper implanted malicious ads on the site for five days, potentially exposing millions of online visitors to infection." "Cybercriminals don't stand still, and exploit kits are constantly evolving to take advantage of newly discovered vulnerabilities and to avoid traditional security systems," said Rod Rasmussen, chief technology officer at IID. "Organizations need to protect themselves by plugging into reliable sources of threat intelligence, then use that intelligence to disrupt malware communications through protocols such as DNS." The Infoblox DNS Threat Index, which is the first security report to analyze the creation of malicious domains, has a baseline of 100 -- the average of quarterly results for the years 2013 and 2014. In Q3 2015, the index stood at 122, up 19 percent from Q3 2014 and down 8 percent from a record high of 133 in Q2 2015. 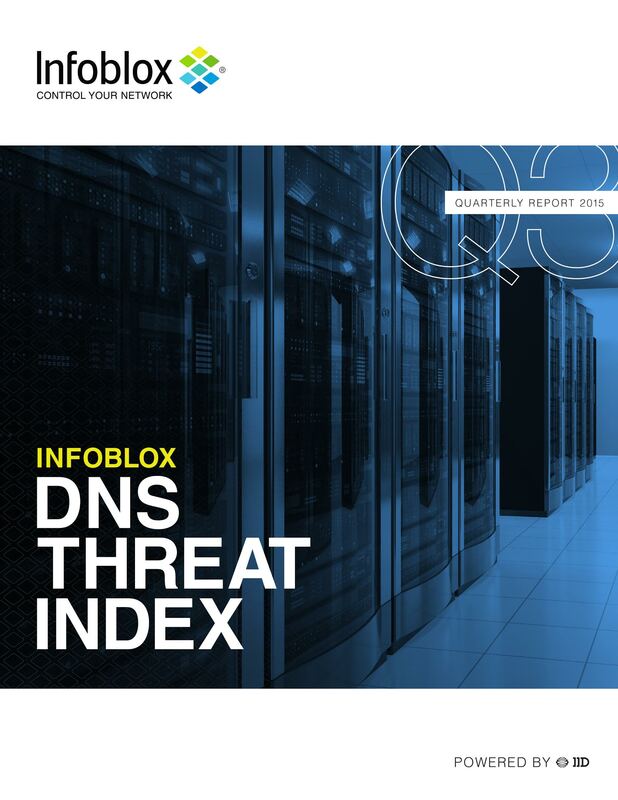 The full Infoblox DNS Threat Index report for the third quarter of 2015 is available for free, with no registration required, at www.infoblox.com/dns-threat-index. Infoblox (BLOX) delivers critical network services that protect Domain Name System (DNS) infrastructure, automate cloud deployments, and increase the reliability of enterprise and service provider networks around the world. As the industry leader in DNS, DHCP, and IP address management, the category known as DDI, Infoblox (www.infoblox.com) reduces the risk and complexity of networking.